Includes work by Louise Bourgeois, Beverly Buchanan, Heidi Bucher, Marvin Gaye Chetwynd, Nan Goldin, Klara Lidén, Hilary Lloyd, Sarah Lucas, Joanna Piotrowska, Penny Slinger, Andra Ursuta, Francesca Woodman. Room is an exhibition of installations, sculptures and photographs by international women artists, which variously explore ideas around architecture and the domestic environment – historically perceived as a female sphere of activity. Curated by Laura Lord from Sadie Coles HQ, London, Room reflects the multiple, often concurrent, meanings and functions of the room. It represents work produced from the 1970s to present day, which envisage the room as an erotically charged or psychological space, alongside pieces which emphasise the structural or aesthetic properties of interior space. Nan Goldin’s photographic series, Empty Rooms, Berlin/Hamburg (1983-96), taken in brothels, hotels and gay bars, speaks of absent human subjects and activities that have taken place there. 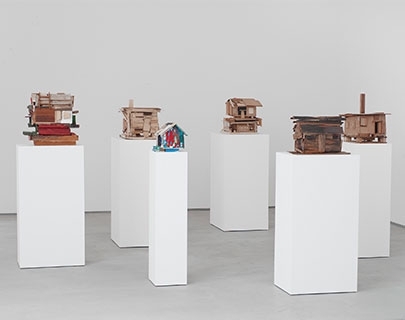 Beverly Buchanan’s series of miniature houses (2009-12), roughly crafted out of wood, allude to shacks, cabins and other basic human dwellings, including those damaged by hurricanes. Heidi Bucher’s Herrenzimmer (1977-78) or ‘room skin’ is an installation made by moulding, in skin-like sheets of latex, the interior of her father’s study in the parental home. The exhibition also includes Cell XVII (Portrait) (2000) by Louise Bourgeois, in which a single elongated head is housed within a glass-fronted cage: a structure both protective and imprisoning. 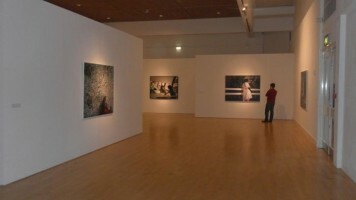 Together, such works depict the room as a tangible entity, rooted in a specific place and time, and yet charged with emotional and imaginative resonance.